What are these curious kitties up to all day? Humans and cats go way back. The relationship sprouted around 2000 BC in Egypt, where humans first domesticated felines. Today, more than 90 million cats in the United States alone enjoy the companionship of humans, while another estimated 90 million are stray or feral. As in most relationships, there are still secrets between humans and their feline friends. But a recent study published in the Journal of Wildlife Management shed light on one secret that may have been nagging cat owners: what do outdoor cats, otherwise known as “free-roaming,” do all day? Since there are several cat enthusiasts at The Why Files, we, too, wondered about the answer to that question. And the answer belies a few thorny predicaments peculiar to the cat-human relationship. Decked with radio collars that tracked their every move, 42 free-roaming cats (18 of them pets, 24 of them owner-less) were the stars of the two-year University of Illinois study. The researchers’ goals were to compare what owned versus un-owned cats did all day, where and how far they wandered, and how likely they were to survive in the often risky outdoors. Certainly, to no cat owner’s surprise, the felines spent much of their time lounging or sleeping, just like their strictly-indoor counterparts. However, the amount of time pet cats versus owner-less cats spent snoozing differed significantly. Pet cats lazed about for 80 percent of their days, while un-owned cats loafed for “only” 62 percent of the time. “That alone is very interesting. It could be associated with their requirements. 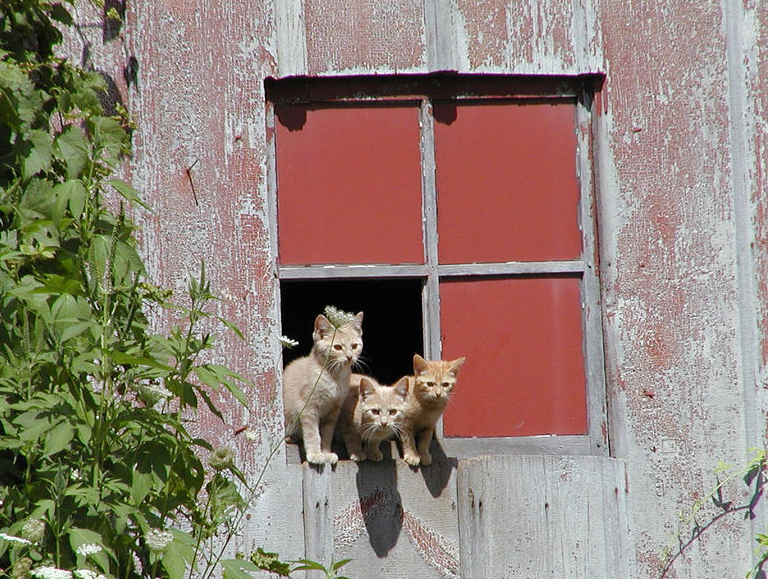 It’s possible that the cats without owners have to spend more time looking for resources to take care of themselves,” speculated Nohra Mateus-Pinilla, study co-author and wildlife veterinary epidemiologist at the Illinois Natural History Survey. Another important finding, according to Mateus-Pinilla, were the differences in the cats’ ranges. 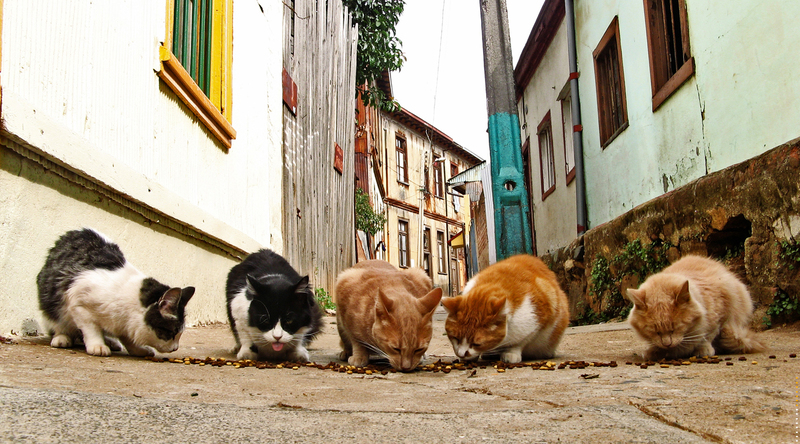 While, not surprisingly, un-owned cats roamed further afield than owned cats, Mateus-Pinilla and her co-authors were surprised by how far the stray cats strayed and by the diversity of habitats they skulked in, as compared to pet cats. 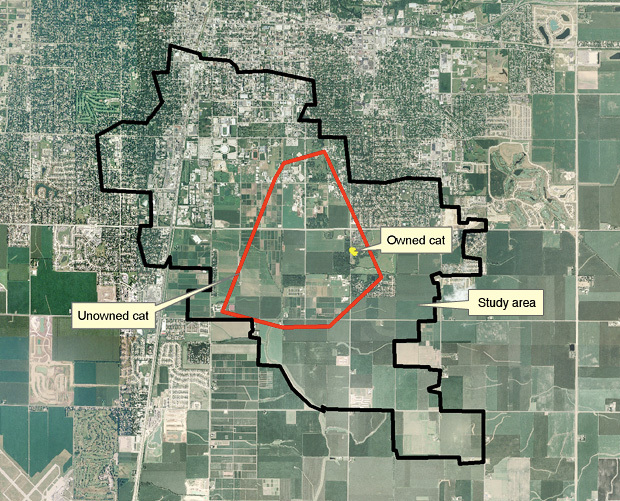 While most of the pet cats stuck close to home, the most itinerant stray cat wandered around a 547-hectare (1,351-acre) area. Despite range differences, un-owned and owned cats’ territories can overlap. The red outline shows the largest range tracked for an un-owned cat in the study, and the yellow dot indicates one pet cat’s range. “Because of the large home range sizes in the evidence of both cats without ownership and cats that are owned, their home ranges are overlapping. And because of the mortality evidence, these animals could be facing a certain amount of risks that we are unable to measure,” said Mateus-Pinilla. Indeed, the risks of being a free-range cat are much higher than those of indoor cats, and if the cat has no owner, its fate is almost always bleak. In their study, six stray cats died, while only one owned cat died. Mateus-Pinilla said their study raises many new questions. To The Why Files, however, it seems that living in the company of humans has its advantages for cats. But keeping this relationship indoors may have advantages for wildlife and people too—-implications that drive the otherwise curious research on free-roaming cats. While the indoor-outdoor debate lives on in the cat owner community, and regardless of whether or not cats enjoy the out-of-doors, their secret lives outside entail some dirty secrets that are alarming scientists and laypeople alike. Multiply this encounter by several million and the average cat on the prowl has a big impact. The sheer number of free-range cats, owned or not, has become a conservation and health concern, some scientists say. Like any species, too many can spell trouble. Cats, by nature, are superb predators. A cat stalking a bird or squirrel is simply doing what cats do. However, their prowess as hunters, combined with their overpopulation, has wildlife biologists and enthusiasts biting their nails over the potential endangerment or extinction of some prey species. “There are a growing number of landscapes in which free-ranging cats are not only the most abundant mid-sized mammalian predator, but they can outnumber all of the native mammalian mid-sized predators combined. So they really do become the dominant mid-sized predator in many landscapes,” said Stanley Temple, an emeritus professor of forest and wildlife ecology at the University of Wisconsin-Madison, who was among the first to study the ecological impacts of free-roaming cats. 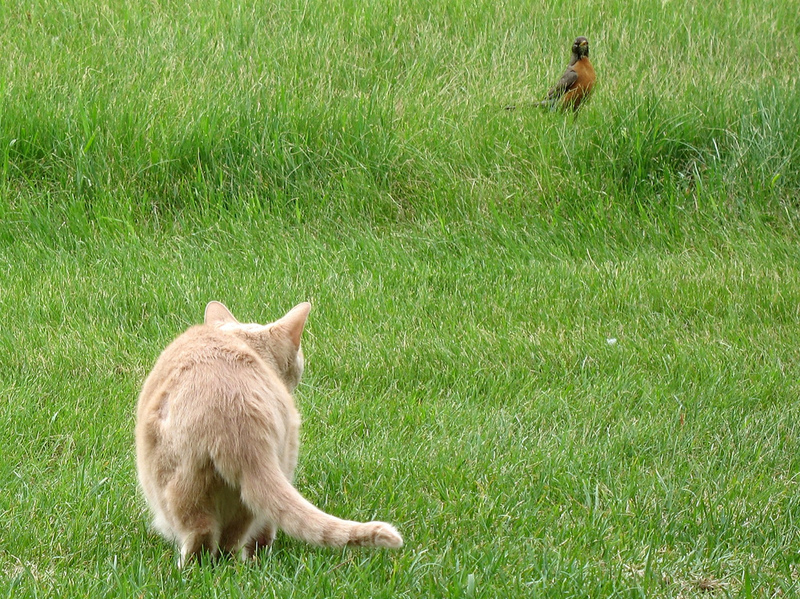 Temple said the impact of free-roaming cats first captured people’s attention in the nineteenth century when one cat took out an entire species of bird. A lighthouse keeper brought his pet cat to keep him company on the otherwise uninhabited Stephens Island off the coast of New Zealand, letting him roam about freely. The cat brought back “treasures” to his owner, and among them was a species of bird that was unfamiliar to the lighthouse keeper. So he preserved some specimens to show scientists back on the mainland. 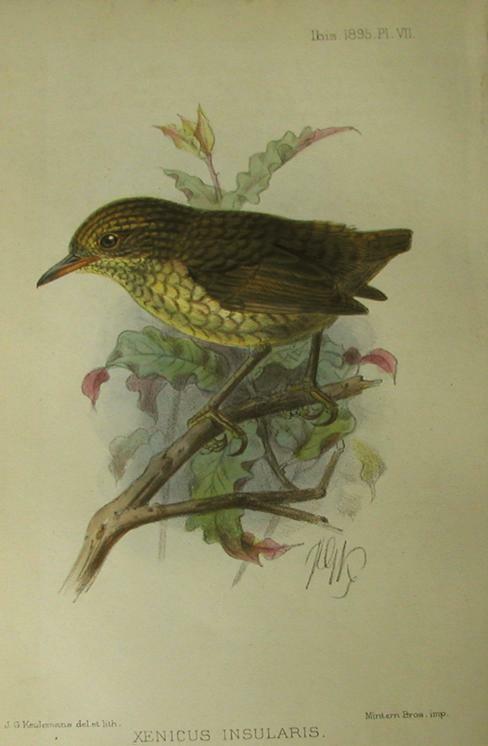 When the scientists confirmed the birds indeed belonged to a new species, which they called the Stephens Island wren, they rushed to the island to check out the bird for themselves. Unfortunately, by the time they got there, there were no survivors left. The cat had singlehandedly done them all in. Open and fragmented landscapes, which also include forest outskirts and farmland, are the territories of choice for cats. And, except in subtropical locales, they tend to stick close to humans. Even if un-owned, most cats are still dependent on people for either food or shelter, or both. “They are remarkably resourceful at taking advantages of the opportunities that we present,” said Temple, who clarified that free-roaming cats are only truly “feral” if they are completely independent of humans. Free-roaming cats’ close proximity to both humans and other animals thus creates a potentially strong reservoir for these diseases. While vaccinating both owned and un-owned cats can help reduce the spread of disease, vaccines are not 100 percent effective and the logistics of vaccinating every single cat may be impossible, especially since many vaccinations are annual. These street cats certainly benefit from a human handout, but do humans benefit from the cats’ potential disease threat? Indeed, solutions to these predicaments aren’t easy. While the science may seem to imply that rounding up every cat on the range may be the best solution, the ubiquity of free-roaming cats and the emotions wrapped up in some people’s relationship with felines complicate the matter. Studies suggest that many free-range cats are people’s beloved pets that are allowed outside, said Temple. But, while keeping every pet cat indoors would significantly and immediately cut the number of free-range cats, not every cat owner agrees that indoor life is best for kitty. To further complicate things, one of the often promoted “humane” methods of attempting to reduce un-owned cat populations — trap, treat, neuter, release — repeatedly fails. Not only are there always the cats that get away, but releasing the cats back into the “wild” still does not eliminate the risks to wildlife. Temple believes that for a cat-control method to work, three criteria must be met: the strategy must actually control cat numbers over large areas, it can’t harm any other part of the ecosystem, and it is socially acceptable. The last criteria can be the trickiest to meet and often creates tension between humans. 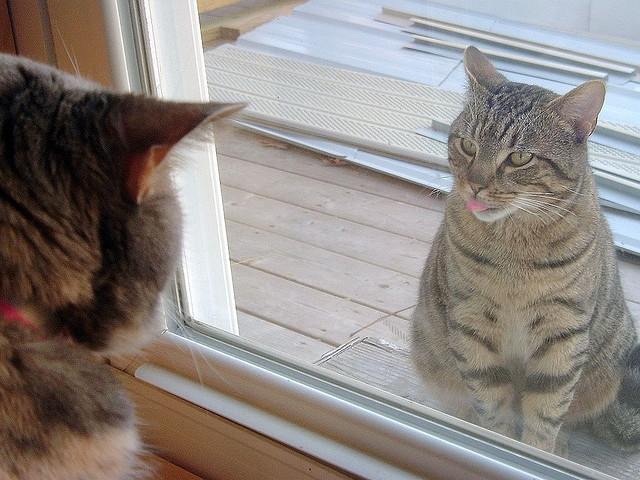 Is this outdoor kitty taunting his indoor pal? But who has the better life? “The divide over how to deal with cat overpopulation, in one way, can be simplified as the group of people who are really concerned about ecological impacts of cats versus those that are really concerned about the welfare of individual animals,” said Temple, based on his years of experience conducting public outreach on the issue. He clarified that he likes cats and is actually the owner of a 21-year-old feline. Temple believes solutions that meet both factions on common ground do exist. Keeping pet cats inside and trapping, treating, neutering and confining un-owned, free-roaming cats are two strategies that meet his criteria. Though, for some people, it will take some convincing. Mateus-Pinilla was careful to emphasize that their study did not seek to evaluate management options. They were focused on adding to the science and remaining neutral in the debate about solutions to the issue of free-roaming cats.